Holy Angels plays a nonconference schedule that includes many of the state’s elite programs. Edina, Benilde-St. Margaret’s, Minnetonka, Burnsville, Eden Prairie ... the list of the Stars’ opponents this season was a veritable Who’s Who of Minnesota hockey powerhouses. Take a look at Joseph LaBate’s statistics, and it didn’t seem to matter who the Stars were playing. He failed to score a point just three times in 26 games. 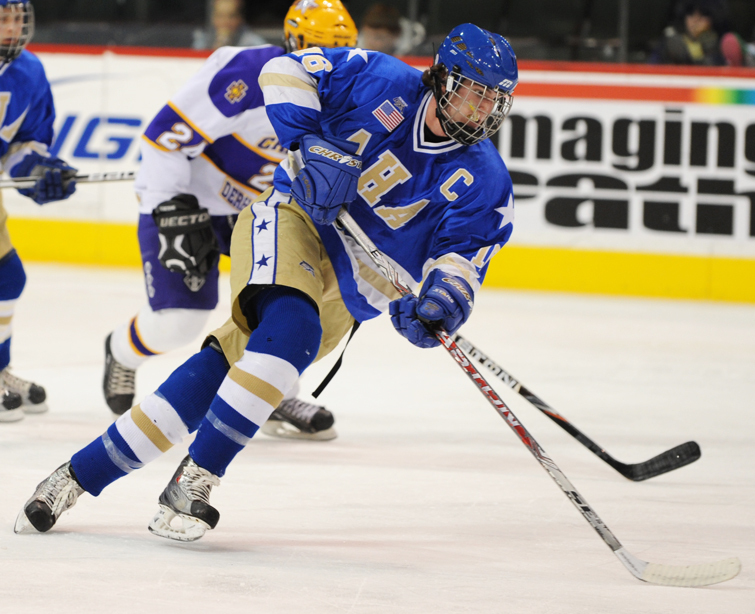 "If you make a mistake in a high school game, usually the kid is not going to score," Minnetonka coach Brian Urick said. "Every time you made a mistake on LaBate, it ended up in the back of the net. You can’t really teach that -- he senses the game so well." LaBate's consistency was sure to catch the eye of a college coaches and pro scouts. So, too, was his 6-foot-4, 195-pound frame. “I told him after we played them that was the best forward I had seen all year,” Benilde-St. Margaret’s coach Ken Pauly said about LaBate, a Mr. Hockey finalist who on Sunday, March 4, verbally committed to play at the University of Wisconsin next season. LaBate, who scored 29 goals and added 23 assist for the Stars, is projected to go in the early rounds of this year’s NHL Draft. He turned down scholarship offers from Nebraska-Omaha, Maine, RPI, Bemidji State and Minnesota State. Upon returning from his visit to Madison on Sunday, he called off scheduled visits to North Dakota and Minnesota. LaBate said the visit included a stop at Camp Randall Stadium. LaBate is receiving a full scholarship and will go straight to Madison next fall, skipping the usual year or two of seasoning at the junior level. Although coveted by most every major Division I program in the country, LaBate said he wanted to take his time with the decision.